It's not the most thrilling part of planning a trip, but deciding on how best to get from the airport to your accommodations (and back again) is usually a detail worth researching. Here you'll find the best tips on getting from Amsterdam Airport to the City Center via ground transportation, and the pros and cons of each. Direct trains to Amsterdam Centraal Station run every 10 to 15 minutes between about 6 and 1 a.m. (every hour during other times). The trip takes about 15 to 20 minutes. Buy tickets either at the ticket desk on the arrivals level or at the yellow machines (with euro coins or with a selected credit or debit card). Trains leave from platforms 1-2 or 3, one floor below. You run the risk of getting stuck in traffic during commuting hours. It's an inconvenience for those carrying large and/or many bags. 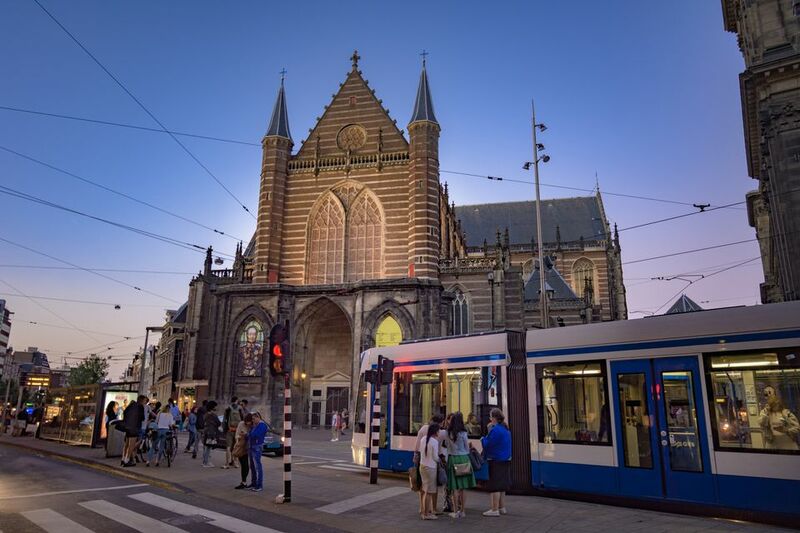 Once you arrive at Centraal Station, you will then have to take a tram, bus or taxi to your hotel. The trains do not run late at night or early in the morning. Tip: Especially if you plan to arrive after 12 a.m. or on the weekend, check the NS (Dutch Railways) website to see if any maintenance works will interrupt your journey. You'll find plenty of private taxis for hire in the taxi line just outside the main entrance to the arrivals and train station level at Schiphol. Be sure to choose a taxi from this line, not from individuals walking around soliciting their services. Note that taxis run on a strict meter basis, there is no set flat airport rate. The convenience of door-to-door service. A trip to central Amsterdam can be as little as 20 minutes if it's not rush hour. It's the most expensive option. There's a high risk you'll sit in heavy traffic at peak commuting hours. Bus 19, the Amsterdam Airport Express, is a cheap transportation option little known to tourists. On weekdays, the bus leaves Schiphol approximately every 10 to 15 minutes between the hours of 5:15 a.m. and 1 a.m. from bus platform. Weekends have much less frequent service. The journey takes about 30 minutes to the city center, and you can pre-order tickets online, or pay the driver in cash. Can be more direct than the train if you're staying near one of the bus stops. No service late at night/early in the morning. The Schiphol Hotel Shuttle, run by Connexxion, offers service to more than 100 Amsterdam hotels. Buses run every 30 minutes between 6 a.m. and 9:30 p.m. from platform A7, just outside the main entrance to the arrivals and train station level. Journey time varies based on stops. Buy tickets at the Connexxion service desk at Arrivals 4 (opposite Starbucks), or online. Be sure to ask your hotel first if they offer a complimentary airport shuttle. If you're one of the last stops on the shared route, the journey could take up to an hour. What Are Amsterdam's Best Webcams?